We have no further information than that, but the following, excerpted from a 1999 article by Sean Laffey on the FolkWorld website, may remind readers who encountered S�amus from the memorable UK tours he made with Jackie Daly in the Seventies of a lovely player and a lovely man - Ed. 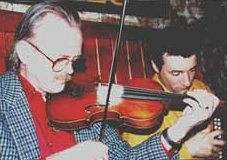 S�amus was born in Killucan County Westmeath in 1946, his early musical education was an introduction to dance band violin from his neighbour Larry Ward. There was very little music in the home; S�amus has said "I often wonder if I was a changeling - nobody in our house smoked, drank or made music." A brief excursion with a ballad group in Dublin where he played guitar brought him closer to the traditional fold. In the early sixties he spent many a night in O'Donoghues with Ted Furey the fiddler who was a vital bridge between the ballad and traditional scene . Then in 1967 he made trip to Baltimore in West Cork, just for a weekend, he still hasn't escaped the pull of Cork. Not that all his time has been spent in Ireland's largest county, he lived for five years in Newfoundland, I asked him had he picked up any of their tunes? "No not really, I couldn't work them out. You see" he laughs "they were playing all these Irish tunes to Breton dancers. The two didn't really fit, you had to work the tune to fit the dance pattern, sometime you'd be playing seven bars, other times nine to what was essentially eight bar Irish music, I couldn't fathom it at all!" He also spent some time in London making a few shillings busking on the underground. I wondered had he ever been moved on or arrested. "I was very lucky, at the Green Park tube station I met one of the transport police he was from East Limerick and he loved the Blackbird, when he was on duty I could play for as long as I liked!" Back in Cork in the late sixties S�amus began playing with Jackie Daly at CC� sessions in the Country Club Hotel. This opened his ears to the music of Slaibh Lucra. "When I heard Jackie playing it was like nothing I heard before. There were plenty of fellas that owned boxes but very few box players." There followed a ten year partnership that was to be marked by the 1977 Gael Linn Jackie Daly and S�amus Creagh album and introduced him to the polka repertoire of Sliabh Lucra . At first he wasn't at all keen on the polkas, he would have been playing a standard selections of jigs and reels, but playing for dancers in The Phoenix in Cork City, sessions in Baile Mh�irne and Ovens changed all that. Unlike his Canadian sojourn, here he linked the dances to the tunes and the result is his present deft and sensitive touch with the repertoire. A week later at the launch of the S�amus Creagh and Aidan Coffey CD on the Ossian label, at Beamish and Crawford Brewery in Cork, Nuala O'Connor in the key note speech remarked on the vibrancy of the Sliabh Lucra. You see the music has a strong local character, it is the mother lode of slides and polkas, and the reason these have survived and prospered is that it is still very connected to dance. And their latest CD will neither tie your feet to the floor nor tire you out, it is rooted in an understanding of the music that goes beyond the accomplishment of notes.